For The Doctor and his travelling companions, Peri and Erimem, it’s a twisted playground, where reality, morality and sanity no longer apply. Stranded within a dimensional nexus, beset by the molten fury of the Firedbreed, they must unwrap a terrifying mystery of damaged timelines and dark science… before the corruption of the Axis spreads and reality itself crumbles. Pete Davison is the Doctor in The Axis of Insanity. So, what exactly do Time Lords DO? We know what the Doctor does. Travels through time and space with a bevy of companions, experiencing the wonders of the universe through their eyes, fights against tyranny and evil, and engages in vigorous cardio exercise via intense running. Seriously, watch the classic series and you can see why Roger Bannister, an Englishman, first broke the four-minute mile. But we also know that the Doctor is rebelling against Time Lord society by his actions. He finds them boring and stuffy with absolutely horrific fashion sense. Beyond that, however, the Time Lords are arrogant, seeing all of time and space as theirs to command and control, while also stagnant and xenophobic, doing their best (or worst) to stay out of galactic affairs and the development of alien races…and at the same time, kickstarting the Time War all the way back in Genesis of the Daleks. However, the Time Lords take the concept of “Lords of Time” very seriously. From Gallifrey, they monitor the Web of Time, a meta-physical construct that contains the existence of all time in the galaxy and therefore all the events that have occur, will occur, are occurring at that moment, and WILL occur in all moments. The Time Lords make sure Time stays stable and that, aside from small hiccups and course corrections, history remains unchanged. This gives the Time Lords a great amount of power in that THEY get to decide, in a fashion, what has happened and what will happen again. But it also gives them a great measure of responsibility to ensure Time continues to flow, and that those who try to meddle with it or change history ”for the better” do not cause a more extreme and disastrous event to occur. Many times during the classic series, the Time Lords would ask/request that/simply screw around with the TARDIS to send the Doctor to look into some sort of disturbance with the Web of Time, if of course the Doctor hadn’t detected the disturbance already and decided to look into it himself, maybe because of curiosity, maybe because he still felt some sense of duty as a Time Lord. The Axis of Insanity sees the return of the Fifth Doctor to the monthly range. Alongside of Peri and Erimem, the Doctor finds himself opposite a villain who knows what the Time Lords are capable of and is counting on them to step in and stop his plan. Written by a long-time veteran but a first time Big Finish contributor, the story showcases Five’s personality and gives Erimem some more room to breathe, only to gloss over the more interesting plot points in favor of action. The TARDIS has found itself pulled to the Axis; a twisted landscape of gravity-defying corridors and impossible angles. It is here that realities the Time Lords considered too damaged or warped are cut away from the main timeline and grafted onto the central spindle of the Axis to exist without infecting the Web of Time. Often, the Doctor amidst, the timelines are damaged thanks to Time Lord meddling, and as such, the Overseer of the Axis is not too fond of his kind. But, as the Doctor soon finds out, the Overseer has been replaced by the Jester, a madman who delights in twisting reality and spreading the chaos trapped inside of the Axis. The Doctor is ready to step in and stop the madness from reaching the main timeline…which is exactly what the Jester was hoping for. After four straight serials of Paul McGann and the ups-and-downs of the Divergent Universe, I’m going to come right and say it was an absolute pleasure to hear Peter Davison once again. Don’t get me wrong, I love McGann and I could and did listen to his first and second “seasons” straight through, but the last season was a major drain thanks to two really good stories and two sub-par stories. One of the great things about Doctor Who is that, if you don’t like your Doctor (or rather if you don’t like your Doctor’s serials), you can get a new one. Being able to go from McGann to McCoy to Baker to Davison to Baker, in any order one likes, is one of the great things about the franchise. Davison actually gets to play two different Doctors in The Axis of Insanity. As the Doctor himself, Davison’s performances personify the characters traits that define the Fifth Doctor. He’s cautious even as his curiosity gets the better of him, polite and alert as he follows the Jester through the Axis…and the fact that following the Jester through the Axis is a foolish but brave thing to do is also something the Fifth Doctor would do. When push comes to shove, he’s dashing and brave, and outraged at the atrocities around him. And during the climax of the story, we get a grand “Davison Speech” about what it means to be a Time Lord and just why he’s willing to sacrifice himself for the greater good, ala his eventual sacrifice for Peri that causes his regeneration in The Caves of Androzani. Davison is a fine actor, and when given good dialogue and a proper villain to play off it, he’s absolutely brilliant as the Doctor. During the third episode, Davison plays the Doctor again, but this time he’s the Jester disguised as the Doctor. Davison hits all the same verbal tics; the pauses, the “ah’s,” the “really’s,” and the “well then’s,” but he adds a level of hyperactivity to it that fits the violent persona of the Jester. On the other side of the coin, there’s something just a bit off about Nicola Bryant’s performance in this story. I don’t know if her “American” accent was slipping or someone in the sound crew did some sort of auto-tuning to her voice, but the actual vocals were…a bit tinny? A bit higher-pitched? I don’t know if the sound crew had difficulties when they recorded her dialogue or if Bryant simply had an off-session (or I might have a bad mp3 download, it has happened!). Peri herself also seems a little off-balance. She’s very eager to needle and prod, and her teasing of Erimem for having trouble learning to read English and the Doctor for having trouble with the TARDIS. The Doctor/Peri/Erimem dynamic has taken on a family quality, with the Doctor as the parental unit, Peri as the Big Sister, and Erimem is the Younger-But-Not-By-Much Sister. For the first two episodes of The Axis of Insanity, Peri is very bossy, very prickly, and very domineering, and it’s very off-putting. Luckily, it does even out in the later episode, but it’s not due to the writing but due to the story moving along at a quick pace. It’s not one of Bryant’s better performances in this story, and I really hope it could be chalked up to a one-time thing. Peri’s presence in The Axis of Insanity was a bit more “damsel in distress” and “comic relief,” so Erimem takes the starring companion role this time out. Caroline Morris’ performance as a Big Finish companion is leaps and bounds away of Conrad Westmaas as C’rizz. She’s trying to learn a new language, manages to outwit the Jester-Doctor, and using the bits of information she gathered defeat the villain’s master plan via her quick escape. Even when she’s rotting through the decaying and carrion-infested corpse of a Time Lord for his TARDIS key, Morris plays Erimem with a core of inner strength and determination. Whereas Erimem could easily have been a simple rehash of Leela’s “fish out of water” character, the writers have written her with a more direct urge to learn specific topics vs. Leela’s insatiable curiosity about everything. The other character in this play is Tog, played by Marc Danbury, a veteran voice over actor. His performance is as another refugee from a damaged timeline, but he realizes that his timeline must be shuttered away and fights to keep the Jester/Jarra To from winning. He plays the right mix of anger, desperation, and acceptance of Tog’s plight, to the point where I kind of wished Tog was in the Divergent Universe with Eight and Charley and C’rizz was the “temporary companion” in this story! Simon Furman has only written The Axis of Insanity for Big Finish, but he’s an experienced writer whose focused on the realm of comics. He’s penned several comic strips for Doctor Who Magazine, including Seven’s first story arc, but is best known for a long run on the Transformers franchise. Several notable story arcs in the Transformers comic books and several episodes of Beast Wars can be traced back to his pen, as well as Annihilation, aka “The Marvel Comics Crossover Everyone Should Have Been Reading in 2006 Instead of Civil War.” With his resume in mind, the best way to approach The Axis of Insanity is that of a comic book somehow put to audio form. 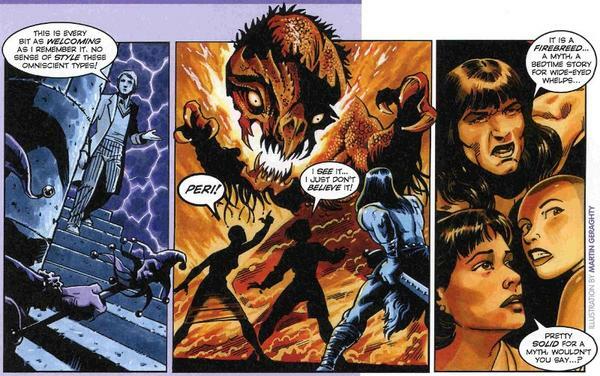 Furman’s script does its best to paint a rich and varied landscape, taking full advantage to introduce strange locations, both in setting and in design, and creatures such as the Firebreed, dragon-like reptiles hungry for a piece of the Doctor and his companions. The final episode takes place in a scientific tower high above a field of lava that crawls with Firebreed. Furman describes, via the characters, these areas in detail, setting them firmly in the listener’s mind as the characters rush about and do their parts to save the day or conquer their foes. The Axis of Insanity does its best to come off as an epic story. It’s certainly one that would be hard to pull off on a television budget. But one can tell that this is Furman’s first audio script because there’s no sense of narrative flow. The story moves from one set piece to the next set piece with only the barest of ties strung between them. For example, the Doctor needs to discover the Overseer is dead, so he blindly follows the Jester through several twisted rooms, barely acknowledging the weirdness and danger of the situation. The Doctor IS a bit naïve and blasé about things, but not to this extent…but it’s just so the Doctor can find the dead body of the Overseer and realize he’s in trouble. The script demanded it, and so it happened, even if it goes against the nature of the Doctor, especially Five. A chase through a twisted carnival is fun and full of tension, but the end of that chase simply rolls right into the next scene. “Ok, the chase is over, the bad guy has to escape in the Doctor’s TARDIS.” That’s it, with little bridge between the scenes. Even an urgent situation like that demands a little bit of exposition. I mentioned Tog and C’rizz switching places earlier, and this story could really have fit, with some tweaking, in the Divergent Universe arc. It definitely could have replaced The Creed of the Kromon! Furman’s script, with the idea of separated and broken timelines, screams “Divergent Universe,” but the script barely touches upon them other than as locations for events. The Axis is a place that could have been, and should have been, explored further. How did these timelines get broken? What makes a timeline considered to be “broken?” How many of these timelines were broken by the Time Lords? Can a timeline be “fixed?” Furman has some great ideas, and I would love to have him come back and do another audio story. The Axis of Insanity has the core of a good story, and a more experienced audio writer (or someone other than Gary Russell directing) could have gotten more out of it. In the end, it’s a very fine first effort by a writer, an effort that makes me want to seek out more of his work, and it’s also a very fine return for the Fifth Doctor and his companions. 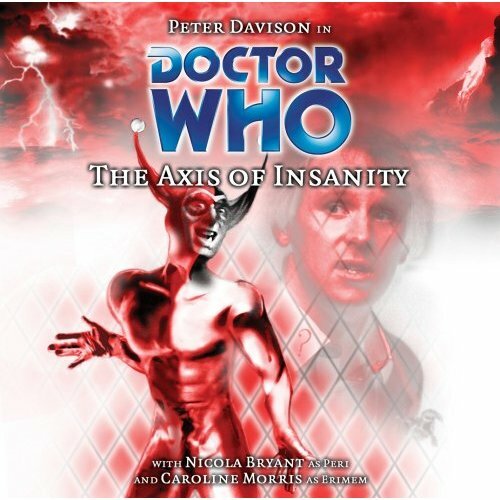 Synopsis – In a timeline where it little more narrative flow, a deeper look into some of the story’s ideas, and a toned down performance by the villains, The Axis of Insanity stands out at one of Big Finish’s best. In this timeline, we still get to enjoy a script full of good ideas and a fine performance by Peter Davison. 3/5. Colin Baker is the Doctor in…Arrangements for War. This entry was posted in Big Finish Review and tagged 3/5, Big Finish, Big Finish Review, caroline morris, Doctor Who, Doctor Who Audio, Doctor Who Review, Erimem, Fifth Doctor, Nicola Bryant, Peri Brown, Peter Davison, TARDIS. Bookmark the permalink.